As a veteran conference-goer, seasoned speaker, and email industry advocate with 20 years of experience in the channel, I’ll attempt to set the record straight with this scoop on 2019 email marketing events. I have spoken at, attended, and/or been on the planning committees for most of them, so in the interests of total transparency I’ll disclose my involvement when applicable. Nearly every major Saas platform enabling email marketing – whether an email services provider (ESP), marketing automation (MA) tool, eCommerce platform, CRM system or whatever – hosts its own annual user conference. This list is not all-inclusive of those events, since most are open only to clients of the hosting company. Where such vendor-hosted conferences are open to the general public and have attained critical mass, I’ve included them. Companies like Experian, SalesForce, Adobe, Bronto, Marketo, Magento, Dotmailer, Iterable, MailChimp, Emma, Emarsys, Litmus and many, many more have put on large if not legendary events in the past (ET Connections anyone?). I recommend you DO attend your vendor’s annual event, especially if you’ve never gone before; but – go beyond! Only by attending a non-vendor-specific event will you get a truly unbiased view of what’s happening in email – whether specific to your industry, sector or the channel as a whole. Retailers and etailers were early adopters of email marketing, so the many events in this arena routinely include email marketing experts and thought leaders, plenty of email vendors, and even pre or post-conference sessions and workshops on email. Conferences like eTail West and eTail East, ShopTalk, NRF’s Shop.org, Internet Retailer’s IRCE, CRMC, and more come to mind. These are fantastic if you need to cover the gamut of merchant marketing concerns from analytics to email to web site to in-store, inventory, and merchandising. However, many of them are huge, diverse and distracting. If it’s email-centric you want, you’re better off with the list below. Less email-centric than etail and ecommerce events yet still covering the channel, digital marketing conferences offer a broader omni-channel perspective vs. deeper channel-specific expertise. My favorite events in this category are TechMedia’s annual Internet Summit and their Digital Summits (held in at least 18 cities this year; I’ve spoken at many in 2017 and 2018). Even though email is on the agenda it’s not the main focus, so consider your goals. Travel, Insurance, Retail, CPG, Banking, B2B, Healthcare – all verticals also have their own marketing conferences. Chances are email and related digital marketing channels will be on their agendas, but you’re unlikely to get a deep dive so if email is essential to you or your primary job focus, check out the list below instead. Since their first EiQ conference in 2017, email agency BrightWave has built a reputation for focusing on the cutting-edge in email marketing. The goal of EiQ is on the progressive and unique topics that matter most. Many sessions focus on how to look at typical strategies – like email newsletters or triggered campaigns – with fresh eyes. Keep in mind, this is hosted and funded by a single vendor (albeit an agency vs. software company) so they are the sole determiner of the program, topics and participants. New kid on the email event block UNSPAM by the Really Good Emails crew promises “this ain’t your mama’s corporate conference”. As it debuts this year it aims to stand out in several ways, not the least of which is size (organizers are intentionally keeping it small enough – under 250 people – to foster 1:1 relationships) and a near total lack of vendor/sponsor booths, promotion, logo-splashing, and pitches. Speakers will be uncensored, meaning “they will be able to say what they want AND what attendees want to hear”. Participants are encouraged to ditch the “business attire” (although most conference-goers I’ve seen already have, just sayin’) and wear what they want, as long as it’s enough so no one’s getting arrested. The conference doesn’t start until 10AM each day (amen, because seriously, do we need to be rushing down to crappy conference continental breakfasts at 8AM before we even get the chance to check email?) giving attendees breathing room to work and conference. These are email people, after all, doing the job that never rests. Most of all, UNSPAM is striving for unconventionality by declaring a departure from the standard sitting-all-day-in-one-session-after-the-next format, so they’re shaking it up with groups, competitions, awards, and more. Now that sounds like a breath of conference fresh air! Best of all, it’s un-expensive at only $285. Get on it if you want to go to this one . . . it’s coming up fast and will likely sell out. Ideal For: B2C brand email program managers, email designers, email teams, and companies with large (by large I mean at least six figures) email lists who are frequent or high-volume senders. The annual conference of the Email Experience Council (eec), this is the largest and longest running independently-produced email marketing event in the US (if not the world), having debuted in 2008. And yes, I not only serve on the board of the EEC, but have attended and been a speaker at this event every year since it began. On the plus side, it takes a democratic approach to programming. Every year there’s an open call for speakers, and a volunteer planning committee votes on submissions based on quality, relevancy to the state of the channel, and speaker experience. All sessions must include a brand-side (marketer) speaker, so you won’t see any vendor pitches here. The conference focuses on the most relevant, timely issues in the industry, features many established thought-leaders, and seeks keynote speakers both from within and outside the channel so fresh perspectives are conveyed. Topics range from strategy to tactics and include everything from AI to testing to analytics, deliverability, design, data issues, use of automation, regulatory and legislative developments, and more. This conference is a balanced mix of education, networking and social fun, even offering an optional pre-conference workshop day before the 2-day main event. Ideal For: First-time email conference attendees from mid to large-size brands, managers and senior execs involved in email and digital marketing, agency leaders, email vendors and service providers. 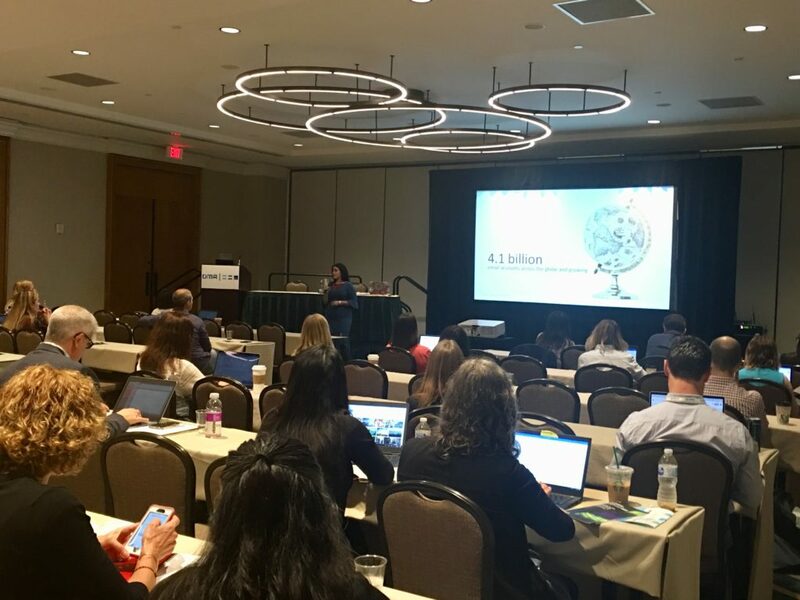 Occurring multiple times per year in both the US and Europe, this is one of several digital marketing events from Mediapost, an integrated publishing and conference company whose mission is to provide a complete array of resources for media, marketing and advertising professionals. Anyone who has attended EIS before knows all-too-well how unconventional it is. Yes, this is the “vacation conference”, where daily sessions end after lunch and outdoor fun (like sailing, sunning or skiing) begins! First-time brand-side participants can attend at no cost other than airfare, the expense subsidized by vendors/sponsors who pay a premium to participate. Venues are exclusive if not lavish, such as the posh Deer Valley ski resort in Utah (for EIS winter). Most meals and activities are included (and delicious). Best of all, the scope is intimate, introspective and senior-level – so it’s ideal for relationship-building, strategy and vision. I’ve spoken or led panels at various US-based events over the years. There’s also a European summit now. Notes of caution: if you’re an introvert or not into the outdoors these may not be ideal events for you. Also, the full conference is nearly three days plus travel, so it’s a time commitment. Finally, if you imbibe bring a spare liver! Couldn’t make it for skiing in Austria but still looking for a European-based email event? This is it! Claiming to be Europe’s number one email marketing conference, Inbox Summit “perfectly fuses real-world practical examples with the experience, knowledge and vision of the industry’s brightest minds from across the globe” (including yours truly, though 2019 will be my first time there). The event is the creation of European email services provider MailKit, which describes it as featuring a carefully curated range of topics to give attendees a rounded and complete experience of the email landscape in 2019. Brand, ISP, and vendor-side speakers from Verizon Media (formally Yahoo) to 250ok to eROI to Activate and more will be on the agenda, along with some of the best minds in email marketing. Set in Prague, Czech Republic in the heart of Central Europe, the historic location can only help deliver on the conference organizer’s promise to educate, inspire and deliver unique networking experiences. Ideal For: European or EMEA-based email marketers from mid to large-size brands, managers and senior execs involved in email and digital marketing, agency leaders, email vendors and service providers. Debuting in 2016 and developed in conjunction with Only Influencers, a closed email marketing networking community, the Email Innovations Summit focuses on exactly that – innovations in strategy, mindset, technology, and application of the channel. Like other conferences, topics run the range of concerns in email marketing and speakers include both brand and vendor-side innovators. A unique feature is the fast paced “shoot-out” style pitch session where early adopters can experience over 20 beta and emerging technologies and innovations in less than an hour. I spoke at and attended the event during its first and third years, and am always amazed at the unique mix of attendees at each conference. While there is some vendor- and thought-leader overlap between this, EIS, EiQ and Email Evolution, they all tend to attract slightly different mixes of both brands and experts. What I like about this event is the focus on what’s emerging or innovative in email. You’ll also find a slightly greater proportion of acquisition vs. retention marketers here since this conference is held simultaneously with conversion marketing events produced by organizer Rising Media. If you’re well beyond the basics in email and burnt out on your usual events, give this one a whirl. This is a newer email marketing conference with a slant more toward data, deliverability and performance concerns than general strategy and tactics. Like Email Innovations Summit, you’ll see a greater degree of acquisition marketers and transactional senders here than classical retention, CRM and retail marketers. The conference is organized into 4 tracks focused on specific roles in email marketing, like content marketing or managing data, making it easy to find the speakers and material relevant to you. This event is less proven than its competitors, happens multiple times a year, and doesn’t include as many established thought-leaders and vendors. On the plus side, it’s affordable and may be local to you. With an established track record and growing momentum, this is the ideal event for email marketing designers, coders, channel managers, strategists and creatives. The 2-day conference focuses on helping attendees become better email marketers with real-world advice, practical take-aways, and success stories related to designing, coding, planning, workflow and analytics. Organized annually by email technology company Litmus, sessions range from data-driven email design, lifecycle campaign planning, cross-channel strategies, tools to automate email development, and more. And since this isn’t a user or customer conference, anyone is welcome to attend. I attended and spoke in 2016 and can attest to its youthful, high-energy artistic vibe. If you’re in the trenches making email happen at your brand or agency, and want to make it happen more fluidly plus learn the latest in cutting-edge creative, this is the conference for you! Ideal For: Email creatives, coders, designers, and program managers. This one is a little different, with a focus on the future of work and communication. Email marketing is about connecting with people, and that’s InBox Awesome, which was rebranded “Work Awesome & Inbox Awesome” in 2018. The focus is on how to better communicate in and out of the workplace, and while that includes marketing this is not as email-marketing-focused an event as the others listed above. It’s a packed, efficient single day though, with 30 speakers and more than 350 attendees across the tech, media and enterprise sectors. They’ll discuss everything from automation and AI, to the latest tools and the future of engagement. It also has a very different vibe than your typical conference, with plenty of opportunity for interaction with the speakers and industry leaders. Anyone interested in finding and connecting with those responsible for streamlining digital and corporate communication will be in the right place. Ideal For: New York City-based or -nearby digital marketing and martech professionals, email marketing managers, office IT, and corporate communication pros. When and Where: Likely December 2019 in New York City, although the exact date hasn’t been set yet so bookmark and check back at the event website (link above). The most recent conference just took place on December 6, 2018. Finally, as much I’d love to definitively answer “which conference should I attend?” I couldn’t possibly; there isn’t a single best event for everyone. Goals: What Are Your Wants vs. Needs? Decide on what’s essential to you (needs) vs. what’s nice-to-have (wants). Professional education? Peer connection and networking? Vendor-shopping? State-of-the-channel immersion and an understanding of cutting-edge developments or regulatory changes? Or maybe a solution to a specific problem? Every event has a different mix of these elements. Know your wants vs. needs ahead of time, then study conference agendas to uncover the mix of education vs. networking vs. social time. Deep dive into the programming to explore whether the topics, speakers and vendors fit your goals and objectives for attending an event. First, there’s event size to consider. Do you tend to do better at an event with a few hundred people, or thrive on the energy of a major Vegas conference? If you’re looking for a new vendor or services, you’ll need an event with many in attendance, whereas if that’s not an objective vendor-variety won’t matter. Second, what’s the scope of the event as it relates specifically to email? Some events focus on a single aspect of email marketing like deliverability, or creative design. Others are more general. The event program will tell you if topics covered are relevant to your type of business and/or day-to-day responsibilities. This one’s obvious; you “get what you pay for” certainly applies. But there are deals to be had so do your homework! Early-bird registration discounts are common. Speakers and sponsors can often give discounts to their clients or peers. Events put on by associations usually discount rates for members vs. non-members. Group packages are often available, as are membership + conference registration bundles. Finally, consider not just the registration price tag, but travel costs and time away from the office (time is money after all). Another obvious factor since you’ll only be able to attend events that fit your schedule or geographic constraints. Remember that exotic locations, while enticing, often require extra travel cost and time. Whatever you decide, remember the most important thing is getting out there to soak up the abundance of inspiration, education and connections waiting to help you unleash the full potential of your email marketing. Questions? Hit me up on Twitter @SyncMarketing and I’ll do my best!